Unity and GNOME Shell have slowly become two of my favorite desktop interfaces, so much that, I just can't stand conventional desktops like XFCE or KDE anymore. I am aware that many of you have a different opinion about the same, but that's just me. And when it comes to GNOME Shell, Ubuntu GNOME (called as Ubuntu GNOME Remix earlier) gave me the best pure GNOME experience till now. 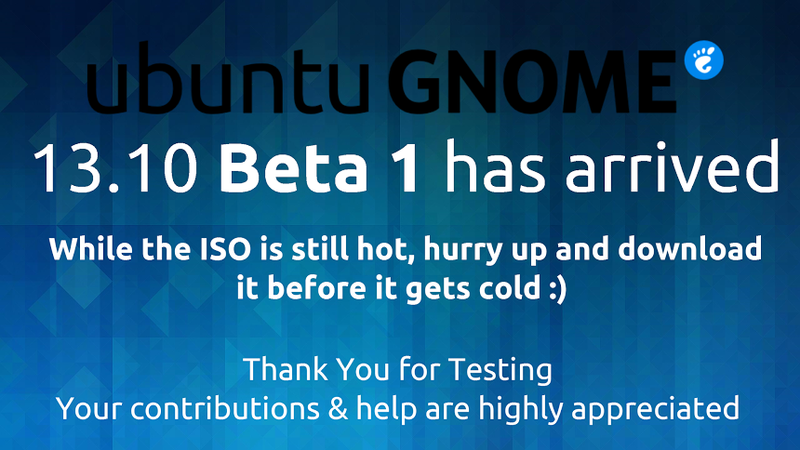 Development of the latest Ubuntu GNOME 13.10 is progressing at a brisk pace and the beta 1 version of it has just been released. Wondering what Ubuntu GNOME distribution is like? Take a look at our earlier review of the same - Ubuntu GNOME Remix full review. Though it was called Ubuntu GNOME Remix before, the distro was eventually renamed to just Ubuntu GNOME during the Ubuntu 13.04 release cycle and is now an official Ubuntu derivative. Help the development of latest Ubuntu GNOME by downloading Ubuntu GNOME 13.10 Beta 1 and giving feedbacks. Please note that, this is an early release and not fit for production machines.